Coffee, bananas, smartphones, automobiles: cargo ships transport goods around the world. 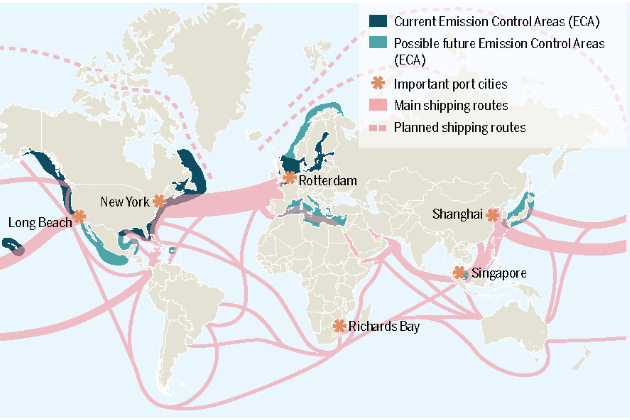 90 percent of global trade is seaborne. Who does what – and who pays for it all? 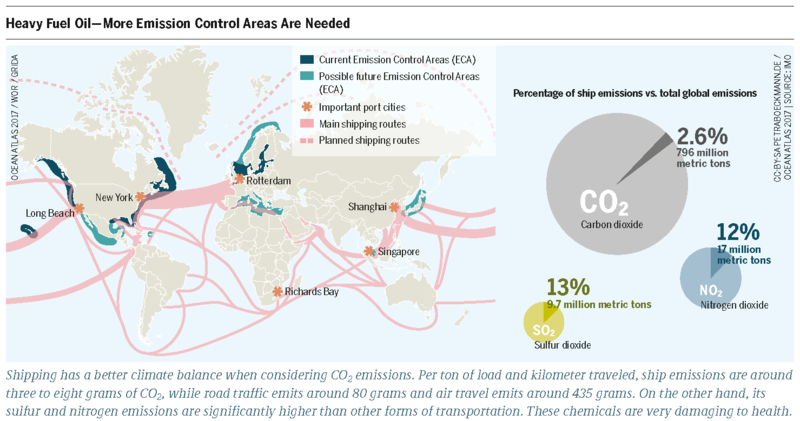 Nine billion tons of goods are transported on around 90,000 ships each year. The trend is toward everlarger ships with gigantic cargo capacities. Shipping is an industry in 170 countries around the world and employs more than 1.65 million sailors and crewmembers. Shipping is thus the most international industry. That also means that the same conditions for safe and environmentally friendly transportation must apply to all ships. That is why the United Nations created the IMO, the International Maritime Organization, headquartered in London, where all shipping nations are represented. The rules and laws governing international shipping are created there. But despite encouraging successes in increasing safety and reducing pollution – the international regulation of maritime transport is seen as “the UN at its best” – there are still problems. The effects of the global financial crisis in 2008 plunged the shipping industry into a deep crisis. During the boom years of globalization, building and financing ever-larger container ships seemed like a safe business – but the expected growth, including that of the Chinese market, proved to be little more than a speculative illusion. 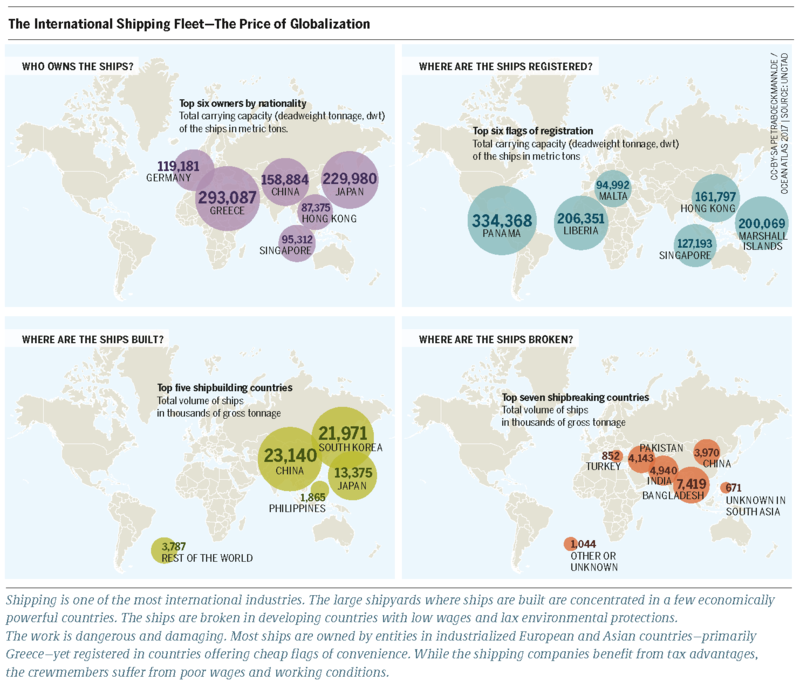 As a result, there are now too many ships for too few goods on the world market. This overcapacity, combined with sinking freight rates and pressure from competition, has led to fierce price wars: it is now possible to ship a metric ton of iron from Australia to Europe for about 12 USD. And the 10,000 sea miles that a container ship travels between Hong Kong and Hamburg make up just a fraction of the total freight cost. The lion’s share, 80 percent of all freight costs, comes from overland transport. The final 800-kilometer stretch from Hamburg to Munich, for example, is far more expensive than the much longer sea journey. Under these conditions, many shipping companies do not earn enough to cover their operating costs or service their credit. The shipping business was traditionally run by midsized family businesses, but that is changing now. As a result of the price war more and more of them are being forced out of the market. Even larger shipping companies are facing difficulties, like South Korea’s Hanjin, which declared bankruptcy in 2016. A further wave of rationalization will come as the result of increasing digitalization: innovations like self-driving ships and end-to-end real-time monitoring will come, but so too will increasing pressure on shipping lines to cover much larger parts of the transport chain by themselves, on sea and on land, than they do today. Even companies like Google and Amazon may present competition to traditional shipping companies in the future. Shipping companies can only endure this price pressure today because they save in other areas, like wages. Open registries and flags of convenience allow ship owners to combine cheap money in industrialized nations with low wages in developing nations. An open registry means that the nationality of the owner and the flag of the ship do not need to be the same. Sailing under a flag of convenience allows companies to avoid expensive regulations imposed by industrialized nations, like labor laws. For that reason it is hardly surprising that, according to the United Nations Conference on Trade and Development, in 2016 more than 76 percent of the world’s shipping fleet was registered in developing countries, including open registries. For comparison, it was just five percent in 1950. For the lower ranking crew members – most sailors come from China, Indonesia, and the Philippines – this is an alarming development. Because of the large differences in wages and social security among international shipping personnel, a global maritime precariat – a class of people lacking socioeconomic security – has formed. The sailors are isolated by months-long absences and language barriers – only the higher ranks can afford expensive flights home. This creates strong dependencies that have led the International Labour Organization (ILO) to count many sailors among the 21 million potential victims of forced labor, which it considers to be a modern form of slavery. And at the end of the journey, it is also the weakest who suffer most from the effects of the price pressure. After their service lives are over, the giant ships are sent to Alang in India and Chittagong in Bangladesh to be broken. The steel colossi are pulled directly onto the beach and disassembled there by hand, greatly endangering the lives and health of the people who live and work there. Whether the International Maritime Organization will act to ensure just working conditions on the ships is an open question – but it is surely a necessary step along the path to a sustainably organized shipping trade. Without the ocean, climate change would proceed far more quickly. The massive volumes of water in the seas greatly influence the changes occurring in our atmosphere.